Michael Empric measuring the record-breaking 3D printed tool. A 3D printed trim-and-drill tool, developed by researchers at the Department of Energy’s Oak Ridge National Laboratory (ORNL) to be evaluated at The Boeing Company, has received the title of largest solid 3D printed item by Guinness World Records. 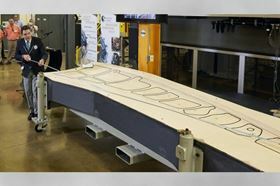 The lower cost trim tool was printed 30 hours using carbon fiber and ABS thermoplastic composite materials, which will be tested in building the Boeing 777X passenger jet. The 3D printed structure 17.5 ft long, 5.5 ft wide and 1.5 ft tall and weighs approximately 1,650 pounds. Guinness World Records judge Michael Empric measured the trim tool, proved it exceeded the required minimum of 0.3m3, or approximately 10.6 ft3, and announced the new record title. ‘The recognition by Guinness World Records draws attention to the advances we’re making in large-scale additive manufacturing composites research,’ said Vlastimil Kunc, leader of ORNL’s polymer materials development team. Boeing plans to use the additively manufactured trim-and-drill tool in the company’s new production facility in St Louis, MI, USA. The tool will be used to secure the jet’s composite wing skin for drilling and machining before assembly. This story uses material from ORNL, with editorial changes made by Materials Today. The views expressed in this article do not necessarily represent those of Elsevier. Stratasys has developed FDM Nylon 12CF, a carbon fiber-filled thermoplastic which could replace metal components in a range of applications.